Viewed through a bureaucratic prism, a mobile workforce is unwieldy, uncontrollable, and unproductive. 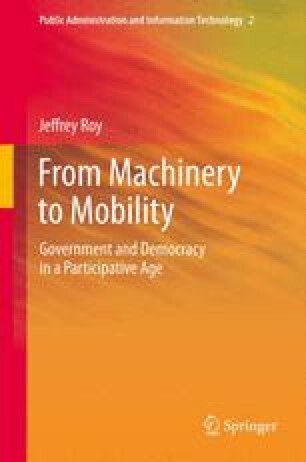 Conversely, a central premise of mobility is precisely the opposite—namely that bureaucracy is poorly suited to collaboration and engagement, much as its ethos of control runs counter to today’s imperative of empowerment. An environment of heightened mobility and virtualization necessitates alterations to the intellectual, physical, and organizational dimensions of organizational activity for public servants working within the confines of government. Yet despite a growing online universe and widening virtualization, the importance of geographic proximity remains a central element of socioeconomic development and public sector organization. Such tensions between the traditional patterns of place (and the physicality of both organizational and jurisdictional governance models) and more virtual communications and interactivity are central to tensions between machinery and mobility.